The “No WiFi” signal, a fate worse than death in the developed world, continues to haunt regions throughout Africa. Welcome to the world’s second largest continent and its even biggest question: How do you provide to 1.2 billion people across 11.6 million square miles? Here’s how the current system (sometimes) works: Africa piggybacks off Internet Data Centers in Europe and North America. The data travels under sea, over hill and dale until it reaches, say, a café in Cairo. This system is akin to the early dial-up networks of the 1990’s. Since the data must travel tens of thousands of miles, African networks suffer from high latency and thousands of frustrated users. Unfortunately, Internet data centers require reliable power. And since few companies trust Africa’s famously unreliable electric grids, data remains stored elsewhere. Nigeria, Kenya and South Africa are home to a few exceptions. Africa, the United Nations, Google, and the guy in that Cario café have plans to change all that. Here are six solutions, some down-to-earth and some moonshots, to bring the Internet to Africa. Before fiber optic Internet, there was DSL and cable internet, both of which depend on copper-wire telephone lines. There isn’t enough copper left for Africa – which is somewhat ironic, as most copper is exported from the continent – and so fiber optic cable has stepped up to the plate. 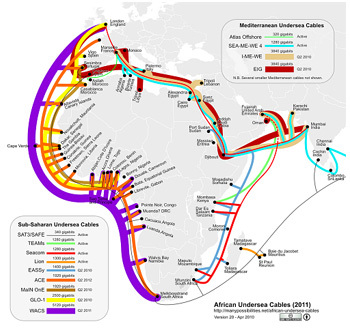 A belt of fiber optic cables surrounds the continent. Intra-state cables ferry Internet access to metropolitan nodes. The rapid proliferation of Internet-enabled mobile phones has driven consumers interest in additional broadband products, pushing fiber-optic internet providers – Alcatel-Lucent and MTN Nigeria recently deployed their 100 gigabit-per-second, “superfast” fiber-optic network – to provide better, faster, connections. Yet despite recent cable installations, local Internet Service Providers still charge exorbitant costs for “last-mile” access. 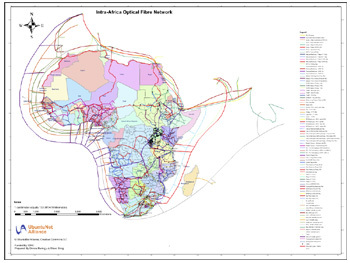 And perhaps even more importantly, as Africa migrates online, many worry that the bandwidth capabilities of existing fiber optic lines will be exhausted in as little as five years, again leaving Africa stranded. The “capacity crunch” is real, and as nations in Africa strive to keep pace with their own swelling demand for broadband they’ll need increasingly novel solutions for data storage and transmission down the line. “Google is all about making the world’s info universally accessible and useful,” says Jeff Fitzpatrick, vice president of product management for Google Maps. The key to this Internet utopia, according to Google Project Loon, is balloons. Each Loon balloon is 40 feet high, 50 feet wide and made of polyethylene plastic. During its 100-day lifespan, a Loon balloon will float about 12 miles in the stratosphere, guided by GPS, and will beam down megabytes like manna. In its other free time, Google has launched several pilot projects to enhance the effectiveness of slower 1G, 2G and 3G networks. In Indonesia, you can download a YouTube video and watch it offline for 48 hours. In South Asia, you can purchase a barebones Android One smartphone like India’s Karbonn Sparkle V. Or you can search millions of mobile web pages painstakingly rewritten to load just a few seconds faster. More than 22,000 miles above the earth, far above the last vestiges of the exosphere, satellites follow geosynchronous orbits, frozen in the sky. Satellite Internet beams data via the Ka band to and from these steel sentinels to parabolic dish receivers. Think satellite TV. Mark Zuckerberg of Facebook fame has expressed interested in Avanti, a global telecommunications company, to release more geostationary satellites into the African sky. Theoretically, with enough satellites, the current sky-high cost of satellite Internet will plummet. Even in Kenya, one of the most developed African countries in terms of Internet, a 15 GB/month satellite Internet plan costs USD $200. The average Kenyan monthly income: USD $125. Another problem with geostationary satellites is that space is not all that empty. So some people, like Zuckerberg, are interested in low-earth orbit satellites or high-altitude drones. These satellites would zoom a mere 6-12 miles above terra firma. Here, there are two roadblocks. For one, a usable system would require hundreds of satellites, and two, there are 54 countries and up to 2,000 languages in Africa. Who can imagine the bureaucratic nightmare of directing flight traffic over state lines? The cheapest option on this list is the use of television “white space,” the unused portion of the television broadcasting spectrum. Microsoft has already completed trials in northern Namibia. The power stations are cheap and could be charged with solar power, some suggest. Mariya Zheleva, a computer science researcher at the University at Albany in New York, believes “white space wireless” is the most feasible option for rural regions. But competition for white space is fierce, and private corporations control most of the spectrum. Loosening the fetters would require government legislation, a process in the past as slow as molasses. Almost all of Africa clusters around the Mediterranean Basin, Lake Victoria and the other African Great Lakes, the jungles of West Africa or the southern tip. Mobile broadband depends on cellular signals beamed from towers with 20-mile radii ranges. It could never work in sub-Saharan Africa. The big question asked at the introduction was, “How do you provide Internet access to 1.2 billion people across 11.6 million square miles?” This question must be revised. Almost half of Africa is under the age of 25. By the end of this century, some estimate, 40 percent of the world will be African. It is for them, the forthcoming three billion, for which something must change. Brandon Joseph is a freelance blogger who covers a wide range of topics, including: education, politics, arts, and entertainment. He is a firm believer that the pen is mightier than the sword, and he is always eager to apply his skill-set in a way that benefits the general public. Democratize internet – its not a continental problem rather a political problem.